Dutch Knowledge for Climate research programme, local governments and horticulture farmers with support from the EU FP7 project DESSIN. ASR-coastal, temporal storage of freshwater in brackish groundwater. Standard aquifer storage and recovery (ASR) approaches are unsuitable in brackish groundwater environments. 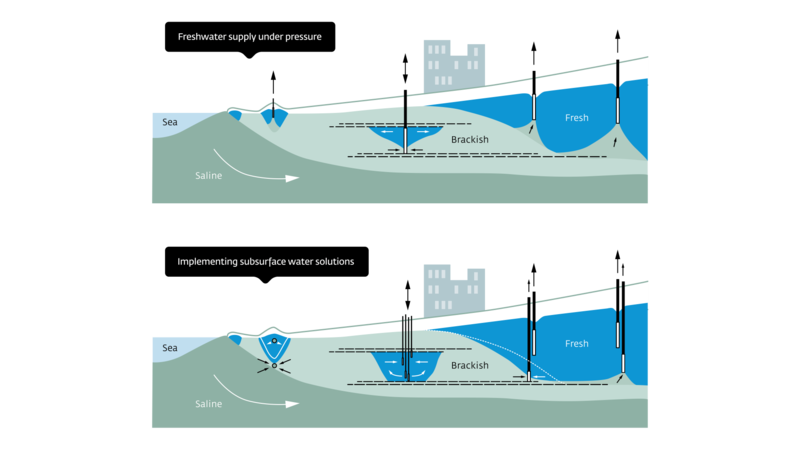 ASR-coastal uses multiple partially penetrating wells to enable deep injection and shallow recovery of freshwater, which demonstrated a boost in freshwater recovery from less than 20% to more than 60% of the injected freshwater.